Walther Lietzmann was born on August 7, 1880 in Drossen, a small town east of the Oder river, the son of an accountant. After elementary school in his native town, he moved at eleven years old to the Gymnasium in nearby Frankfurt/Oder. The spirit of this school favoured the classical languages, but the young student became more interested in mathematics, physics, and astronomy. Passing the Abitur exam in 1899, he decided to study astronomy, but arriving at the University of Berlin he learned that he should begin by studying mathematics and physics. Not very satisfied with his studies in Berlin, he moved after three semesters to Göttingen and became absorbed in mathematics. Studying primarily with Hilbert, he elaborated a PhD thesis on the theory of algebraic number fields and passed the doctoral exam in 1903. After this, in 1904, he passed the Staatsexamen for the profession of secondary school teacher, in mathematics, physics, and biology. Despite his academic qualifications, he decided to follow the career of teacher. In fact, this orientation would make him the exponent of the reform of mathematics teaching in Germany. Lietzmann became a devoted teacher. After one year as a Referendar at a Realschule in Landsberg a.W., he moved as Probekandidat to Berlin, at the Prinz-Heinrich-Gymnasium. His abilities as a teacher were such that he was chosen, even before the end of the probationary year, as an Oberlehrer - for mathematics and physics - at the Oberrealschule in Barmen (today a part of Wuppertal). In 1914, he was called to Jena, as director of the Oberrealschule. Eventually, in 1919, he moved to Göttingen, as director of the Oberrealschule, combined with a Reformgymnasium - today, the school is named Felix-Klein-Gymnasium. Lietzmann remained in this position until his retirement in 1946. The range of his activities can hardly be exaggerated. 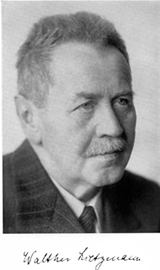 Besides his commitment to IMUK and DAMNU (see next section), he held a Lehrauftrag for the didactics of mathematics and the sciences at the University of Göttingen, from 1920 on. He was a member of the teacher examination body Wissenschaftliches Prüfungsamt in Göttingen. Having been active since his student days in editing publications, from 1905 to 1910 he was the editor of the journal mathematischnaturwissenschaftliche Blätter - a journal for students' mathematical associations at German universities. From 1914 until it had to cease publication in 1943 due to WW II, he was editor of the Zeitschrift für mathematischen und naturwissenschaftlichen Unterricht, the ZfmnU, the major journal for teachers of mathematics and the sciences in Germany. From 1911 on, together with A. Witting, he was the editor of the mathematisch-physikalische Bibliothek, a series of booklets for teachers. From 1924 to 1930, he was president of the influential Deutscher Verein für die Förderung des mathematischen und naturwissenschaftlichen Unterrichts, the Förderverein. Lietzmann was also a prolific writer, not only of numerous reports on issues of mathematics teaching in various journals, but especially of textbooks. The first such activity, between 1911 and 1921, was re-editing and revising an already existing series of geometry textbooks by Max Schuster. The next step was a more profound revision of a classic text, an Aufgabensammlung, a collection of exercises used as a complement to a proper textbook, a very common textbook form in Germany. He revised the classic "Bardey", transforming it into the "Reform-Bardey", that is, remaking it according to the ideas of the reform movement. Published since 1913, in a Gymnasium and in a Realschul-version, it experienced up to 17 editions. However, the bestseller was the textbook of his own, the Leitfaden der Mathematik, published from 1917 on, also in different versions according to Gymnasien and Realschulen, and complemented from 1924 by a version for girls' secondary schools. Lietzmann estimated that between one and two million copies were used in schools, not only in Germany, but also in Austria, Switzerland and the Baltic states (Lietzmann 1960, p. 90). The culmination of his commitment to improve teachers' performance in teaching became his Methodik, a methodology for teaching mathematics (in secondary schools). It was first published in 1916, originally in two volumes; the second edition comprised three volumes. Many chapters were revised in content and orientation; the third edition even appeared with a revised title during the Nazi-period. After WW II, an earlier version of the Methodik was re-edited. Lietzmann died in Göttingen, on July 12, 1959. Although studying in Göttingen, Lietzmann had not been in contact with Felix Klein, since he was only a student of Hilbert. At the time, he had no interest in questions of teaching. This changed during the time of his teaching apprenticeship in Berlin: Klein had been invited there to report on the Meran reform syllabus and Lietzmann was asked to give a review of Klein's talk in the Mathematisch-naturwissenschaftliche Blätter. Meeting Klein on this occasion, he became impressed with the reform movement. Following Klein's references, Lietzmann began to study the French textbooks to which he referred for his reform programme. The paper that which he wrote as his evaluation was his first didactic publication. However, his association with the reform movement itself proved to be the side-effect of another development: since about 1906, due to his own teaching, he had been interested in the foundations of geometry for schools. Since Italian authors had substantially contributed to this issue, in particular with several outstanding textbooks, Lietzmann began to study Italian publications (after studying the Italian language) and corresponded with Italian mathematicians. The paper that he wrote about Italian visions of the teaching of foundations of geometry was published in the ZfmnU in 1908, and should become fundamental for his future life, without him having imagined it. In fact, Klein's attention had been called to this paper and to its author, since the foundations of geometry proved to be the key obstacle for integrating Italian mathematicians into the reform movement. Due to his own private interest, and in order to speak personally with the mathematicians with whom he had corresponded, Lietzmann travelled to Italy at Easter time in 1908 and participated at the fourth International Congress of Mathematicians in Rome. Being present in the section on mathematics teaching - where he met Giovanni Vailati - he happened to assist at the founding of IMUK. Klein, after his election as president of IMUK, approached Lietzmann and proposed that he participate in IMUK work. In fact, he practically became Klein's secretary for IMUK matters. Right from the first meeting of Klein with Fehr and Greenhill, Lietzmann assisted Klein in German as well as in international IMUK work. This was the beginning of an intense involvement into the first international reform movement for mathematics education. Regarding the German scene, Lietzmann not only wrote some of the highly substantial reports within the remarkable series of German reports on the state of mathematics teaching, he also supervised, together with Klein, the production of the other reports. His insertion into the inner kernel of IMUK had the unintended effect that Lietzmann, who was still a teacher and later on a school director, worked in his own teaching to realize the intentions of the reform movement and was thus able to disseminate them more effectively among teacher colleagues and, by means of his teaching materials, much more widely than he would have been able to do through personal contacts alone. There was, on the German side, another institutional means for promoting the reform of mathematics teaching: as a successor to the Breslauer Unterrichtskommission of 1904/1905, which had elaborated the Meran reform syllabus, the Deutscher Ausschuß für mathematischen und naturwissenschaftlichen Unterricht (DAMNU), a committee constituted of numerous German professional associations and societies active in mathematics and the sciences, had been established, with the aim of promoting jointly the reform of teaching mathematics and the sciences in German schools. In 1910, Lietzmann was elected the general secretary of DAMNU and was thus once more in a situation where he was able to further promote Klein's ideas. When, in 1925, not only the proposals of the Meran syllabus, but also more far-reaching concepts of Klein eventually became part of the official syllabus for the secondary schools in Prussia, this was not only due to the broad dissemination of the reform ideas among the mathematics teachers and their practicing by them, but also by the institutional activities of DAMNU. Regarding the international scene, Lietzmann prepared together with Klein all the meetings of the Comité Central and of the IMUK itself, the international meetings and Congresses, first in Brussels in 1910, then in Milan in 1911, in Cambridge in 1912, and eventually in Paris in 1914. Some of the thematic reports were prepared by him, for instance, that on "rigour", due to his studies on the foundations of geometry in Italy. WW I and the dissolution of the first IMUK put a stop to these international activities. When they were resumed in 1928, Lietzmann was elected member of the Comité Central, and in 1932 vice-president of IMUK. In 1936, he participated at the ICM in Oslo not only as the head of the German delegation, but was also re-elected as vice-president. While there were only few IMUK activities from 1928 on, and even less after 1932, there existed but a nominal body from 1936 on. Lietzmann was fortunate, however, in seeing the reestablishment of IMUK as ICMI in 1952 and the reconstitution of the German subcommittee, with Behnke as its president. In fact, after Klein's death, it had been Lietzmann who had presided over the German subcommittee. Klein had passed his files on IMUK activities, which he deemed important to preserve, to Lietzmann; nowadays they constitute a part of the Lietzmann Nachlass in the Stadtarchiv Göttingen.